Hibernian legend Jackie McNamara Snr has expressed his desire to see supporter ownership at Easter Road, however he believes the club’s “fragmented” fanbase need to unite to make his 40-year-old dream a reality. BuyHibs, who are pushing for a fan-led takeover with the backing of former players Pat Stanton and Paul Kane, have requested a meeting with Hibs owner Sir Tom Farmer after urging the Kwik-Fit founder to put a price tag on the club. As yet, Farmer and non-executive chairman Rod Petrie have not accepted the invitation, with BuyHibs rejecting a counter offer of discussions with the existing board of directors, led by chief executive Leeann Dempster. Hibs, meanwhile, are in talks with their bank regarding writing off a substantial portion of their £8 million debt, with details of their progress set to be announced at the club’s annual general meeting, due to be held next month. McNamara acknowledges that the situation appears to have reached an impasse, but it has not dampened his desire to see regime change in Leith. “The takeover talks seems to be at a standstill at the moment, it looks like the current owners are aiming to negotiate with the bank to wipe off the debt,” said McNamara. “But, regardless of that, I’ve been saying since 1974 that fan ownership is the way forward. “The idea of a rich businessman or other ‘White Knight’ figure is long gone. I don’t think Mr Farmer has any interest in football, he has an interest in making money. “There doesn’t seem to be a willingness to name a price, he seems to want the fans to name a price. However, McNamara admits he also has doubts regarding whether BuyHibs are currently the answer. The group hope to fund a takeover in the same way as the Foundation of Hearts did at Tynecastle, with individual fans pledging a monthly amount and business figures committing a lump sum. However, a recent poll on popular fans’ forum Hibs.net showed that only seven per cent of 289 respondents indicated they would pledge to BuyHibs. 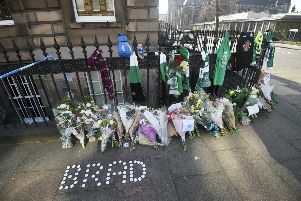 McNamara believes there is still a lack of unity among the fanbase and believes that must be remedied before supporter ownership at Easter Road becomes a viable proposition. “It would certainly be positive if we could copy the Hearts model and have the supporters put their money where their mouths are by pledging,” he continued. “I would like to think the Hibs supporters would do that – I believe they would. But they will only put their hands in their pockets if they know exactly what they are pledging for. Perhaps getting someone on board to unite all of the different factions – in the way Ian Murray MP did with the Hearts fans could be key. “If we could have a figurehead like that, with Pat Stanton backing them up, then I believe the fans would buy into that. But, at the minute, things feel a bit fragmented. McNamara, who was at Bayne Memorial Hall in Loanhead to present the Walking Football player of the year award to 83-year-old Peter Collins, is more heartened by what he has seen on the pitch at Easter Road. “I know Alan Stubbs and I know his football philosophy,” McNamara added. “You can see that shining through in the way he wants them to play. [David] Gray and Lewis [Stevenson] are pushing forward, there is movement in midfield, chances are being created – it is far more enjoyable for the supporters.